Hi everyone! This is Bec, Mark's cousin. Mark as in baby Behr's daddy and hubby to Shannon. First off-a BIG congratulations to the proud parents on the birth of Behr. Don't you love the picture of him with the mini lacrosse stick? I wanted to post about something baby-related and decided on homemade baby-food. My little guy is almost six months old and he's been on solids for a few weeks, so this topic is fresh on my mind. Now, I am not anti- jarred food. In fact, there's a stash of it in the cabinet, but I always thought it would be fun to make my own. This website and this book have been helpful resources. 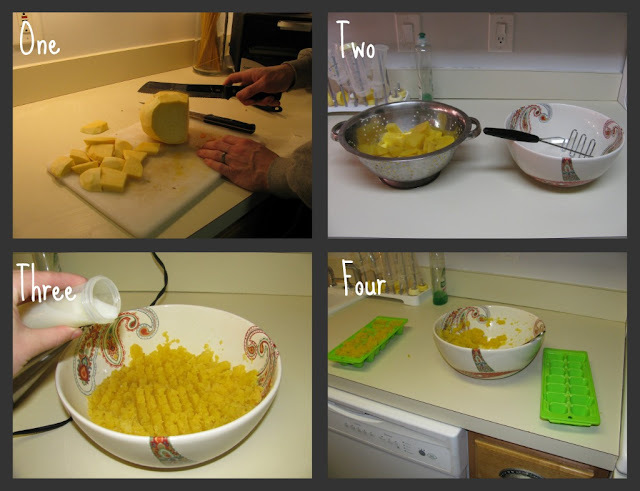 I have found that homemade baby food is not only simple to make, but it saves money which is always a plus! Once the veggie has been peeled, chop it up into chunks and toss it into a big pot. Cover with water and boil until soft, about 15-20 minutes depending on size of chunks. 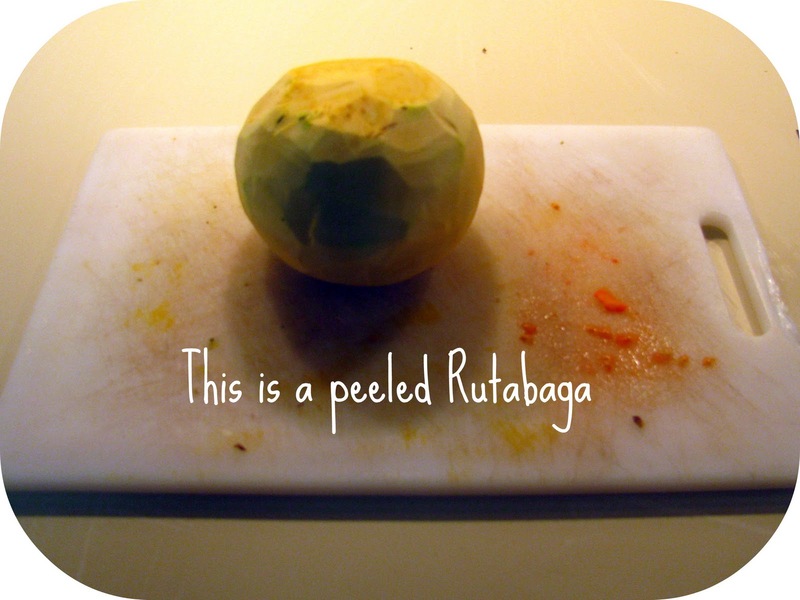 Drain rutabaga and place in large mixing bowl. Add breast milk (or formula) to thin out to desired consistency. Spoon mixture into ice cube trays and freeze until it is used. While some fruits and veggies need to be boiled, baked, or steamed, others can be served without being cooked. Among these no-cook foods are banana, avocado, and papaya. Just peel off the skin and mash up with a spoon. 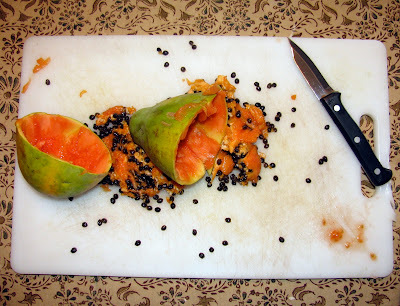 I loved that web site when I was making baby food for my twins. 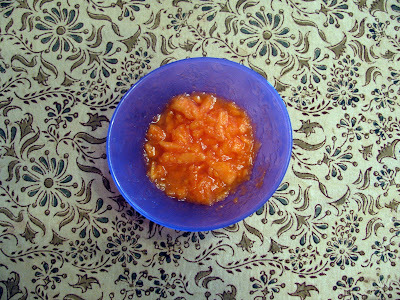 It was so easy and saved me a bundle in jarred baby food! 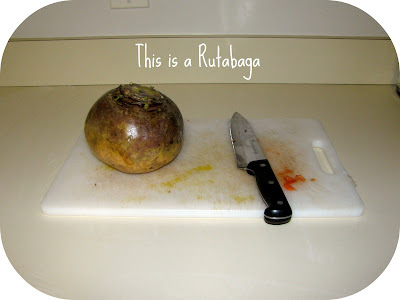 i don't know if i have ever noticed a rutabaga at the grocery store. you should sell your idea to gerber! nice post. Congratulations Shannon!